The new AIR HAWK PRO is the newest line from High Street TV. 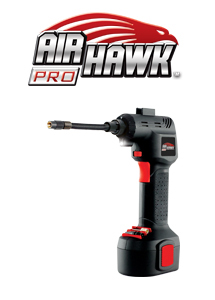 Cordless, Rechargeable, Fast and Convenient the AIR HAWK PRO is a new compact air compressor. With both wall and car chargers you don’t need to worry about your tyres deflating or a flat football ruining your day out. The AIR HAWK PRO includes 3 fittings, one touch trigger, display for accurate pressure readings and a built-in LED display.